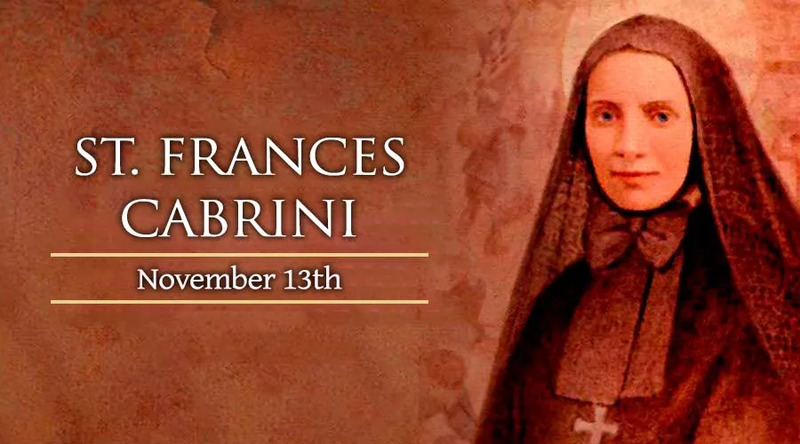 On November 13, the universal Church honors St. Frances Xavier Cabrini, an Italian missionary who spent much of her life working with Italian immigrants in the United States. Mother Cabrini, who had a deathly fear of water and drowning, crossed the Atlantic Ocean more than 30 times in service of the Church and the people she was serving. St. Frances Cabrini, from a young age, longed to be a missionary in China, but God had other plans for her. Orphaned in Italy before she was 18, she joined the Sisters of the Sacred Heart and took on the name “Xavier” in honor of St. Francis Xavier, the great missionary to the Orient. At the advice of Pope Leo XIII, who told her “Not to the East, but to the West,” she focused her missionary efforts on the United States. Accepting Archbishop Corrigan of New York's invitation, she came to America and spent nearly 30 years traveling back and forth across the Atlantic Ocean as well as around the United States setting up orphanages, hospitals, convents, and schools for the often marginalized Italian immigrants. Eventually, St. Frances became a naturalized U.S. citizen. She died in 1917 and was canonized in 1946, just before a new wave of immigrants began to arrive in the U.S.
St. Frances Cabrini is the patron of immigrants.